Sammons in Africa: African explorer! "This way I think, Dr Livingstone!" Alec, Ruth and Zach arrived easily and safely on Tuesday. They left home in Hatfield in the snow - and 2 buses and 3 planes later arrived in Kigoma. A 24 hour journey door to door, which is almost a record. 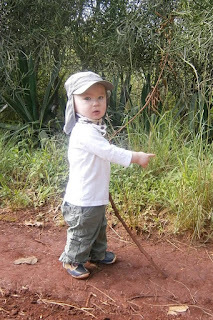 Zach is a delight, and is busy exploring Africa. Chickens, lizards, very large flowers, and Granny's vegetable rack are particularly fascinating. Being grandparents, and spending time with Alec and Ruth, is our focus for the next 10 days. It is wonderful they have made the effort to come - as it's not the standard holiday with a toddler! It's Ruth first time in Africa, but today she put on her midwife uniform and joined the staff at Shunga hospital for the day. Alastair's operation with the equipment featured in the last blog, went very well.